has now been taken over by the Red Cross. 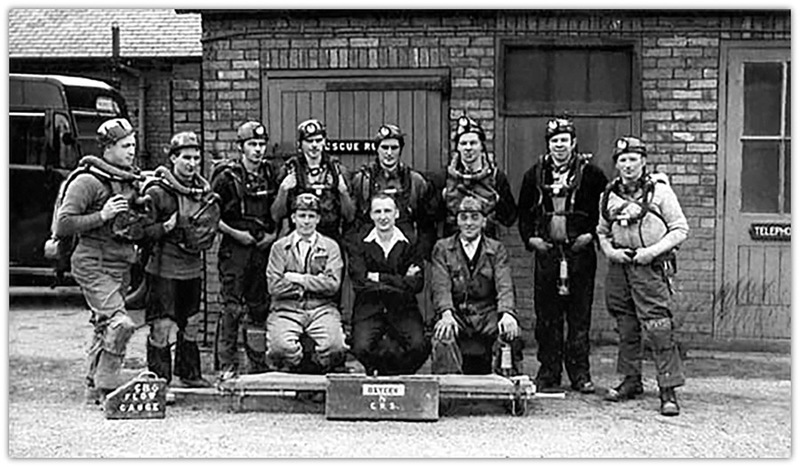 I was shot firer and deputy from 25 years of age and joined Oxcroft Colliery Mine Rescue Team in March 1946. 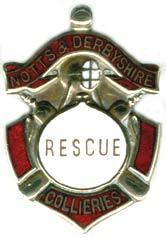 I applied for a position at Chesterfield Mines Rescue on the permanent staff and had 3 months training at the Mines 'Rescue Station before passing for the position. The station was situated on Infirmary Road Chesterfield. It was very compact with houses built around for the officers and brigade men. There was a flat situated above the Billiard Room which my wife, Bessie, and myself lived from 1946 - 1950. My daughter Susan Elaine was born in January 1950. There were several steps to go up to get into the flat, which was awkward for getting a pram up and down, so that year we came down to live at 5 Infirmary Road. The work that we were employed to do was to be ready and prepared for emergencies for surface and underground. Every morning the brigade men assembled in the duty room just before 8 am, when the pip came on the wireless we walked in line into the Drill Hall. The superintendent and two officers were waiting, we were called to attention, saluted and then dismissed. 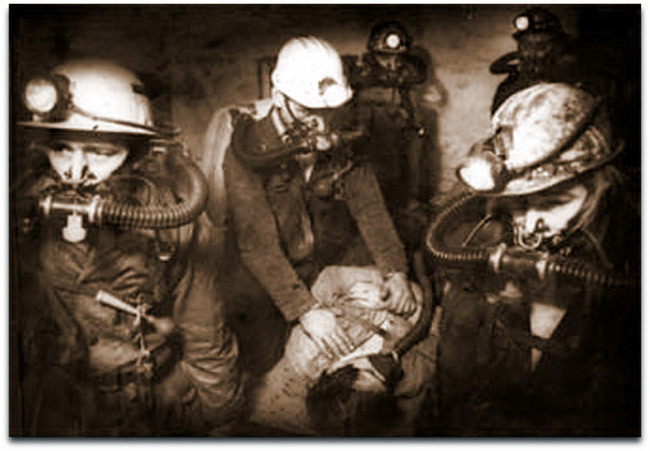 We were allocated jobs for the morning, and every morning the pit rescue teams came to us for training in breathing apparatus in our underground galleries. There were 1/3 of a mile of galleries situated under the station which could be filled with smoke, for working in, which was the only way to train the rescue men in smoke conditions. This proved vital when emergencies arose later on underground. At that time there were 9 of us. Sam Reddal was employed as the motor mechanic, he looked after the two Rescue Vans and the Surface Fire Engine which was a good old Leyland. When the pit teams arrived they went into the Lecture Room for 1 hour, this was actually the Billiard Room. They were lectured by the Officers who explained the pit rescue programme and the tasks set for underground. The rescue men were then instructed how to fill their apparatus with liquid, there was a time limit of 2 hours for working in the apparatus, but there was enough air for another 1 hour safety margin which was sometimes used up. The teams would go underground working in smoke and had to find the seat of the fire and usually they had to put sand and bricks plus rubble to seal this off. We permanent Corps Men had to do the tasks, and had to train 9 times a year plus 3 times a year at different Collieries in the area. Before going into the mine the Captain had to examine each of his team mates apparatus to make sure there were no bad leaks. On arriving back to the surface after 2 hours the apparatus had to be stripped down and cleaned and dipped under water to test for leaks, then re-assembled ready for use later. Sometimes it was my job to run the liquid air plant to stock up the liquid air. We always kept 7 containers of liquid air ready on the Station, each containing 50 lbs. Two canaries had to be taken with the team, pictured here is Wilf Robinson. 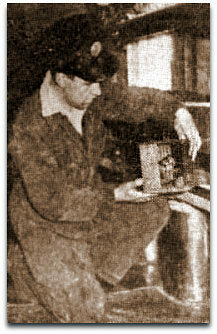 Others were found jobs on the station premises such as window cleaning or painting the steel railing outside. We also had a joiner's shop which was used frequently. We had to finish on the station at 4 pm but only those on night leave were allowed out, and they had to be back for 11 pm. There was a night watchman on 6 nights a week, he was stationed in the Duty Room, and his job was to take emergency calls coming in from the pits during the night. 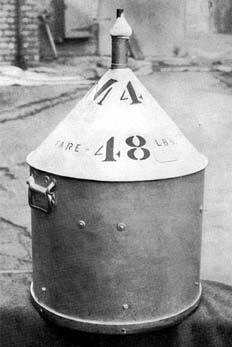 There was a Station Alarm Bell which went off when the calls came in, and we all had an alarm bell in each house. When the alarm went off we were in the back of the van or fire engine within 2 minutes and away. All the wives were out before us, unlocking and opening doors and the large iron gates in front of the Station ready for us to go. The man who took any call had to make sure that he got the right message, he did not have to make any mistakes as to what vehicle was required. Two canaries had to be taken with the team for underground which we used to keep on a shelf just at the back of the rescue van.